Paying For It All – art. college. life. With decision day behind us, seniors are breathing a sigh of relief. College plans are made. Woo hoo!! Let the partying begin. Now it’s time for juniors to begin feeling those uneasy twinges; where will I go? How will I make my decision? What factors should I include in my decision process? Clearly, the increasing cost of a higher education needs to play a considerable role in your thought process. The cost of attending college is still on the rise, and the impact is significant for everyone involved. In fact, even the famed Cooper Union has been affected by the rising tide, stating in a press release last week that after more than 100 years the school will begin charging tuition to undergraduates. Add in the fact that accumulated student debt has outpaced credit card debt, and it’s enough to make every college-bound student and family nervous. Ever an optimist, I do see a glimpse of good news on the horizon. Yesterday’s Huffington Post claimed “Class of 2013’s Starting Salary Tracking Higher On Average Than Last Year’s Grads.” Keep in mind it reads “on average,” but still, the news isn’t all doom and gloom. 2 – Compare the detailed costs. Make sure you research and understand all the costs associated with each institution. That means tuition, room & board, health insurance, transportation fees, books, art supplies, etc. It’s a long list. And some schools will have a breakdown of different costs associated with different art majors. If that information isn’t readily available, ask for it. 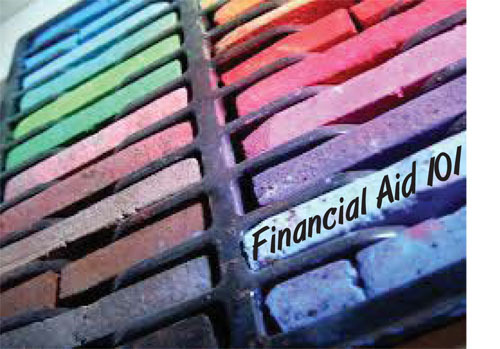 3 – Make time to thoroughly understand financial aid and scholarship opportunities for each school on your list. This process can be thoroughly confusing, frustrating, time consuming, and daunting. But from personal experience I can tell you it is worth the effort. The Net Price Calculator, made available through College Board, is an excellent tool to help you estimate your eligibility for financial aid options, and it’ll help you compare schools in the process. Current participating art schools include Ringling, CCAD, FIDM, Pacific Northwest College of Art, School of the Museum of Fine Arts, SVA, and Pennsylvania College of Art & Design. As for scholarships, remember you’ll get the biggest bang for your buck from the college you attend. That doesn’t mean searching for privately funded scholarships isn’t worth the effort; it just means that the latter typically give out smaller allowances, so be realistic about what you can get. Knowledge is the key. So whether you’re a rising junior or senior – starting your research now is a smart idea. Next week we’ll continue this discussion. This is the first of two posts focusing on financial options and opportunities for art students.